Twin beds with white bedspreads & red walls. The twin beds can make a king size bed. Alongside another room with adult bunk beds. 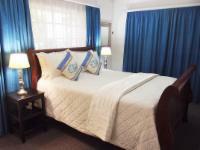 Can be booked as a single, double or family room. Rates will be charge accordingly. DSTV, fridge, microwave, tea/coffee. 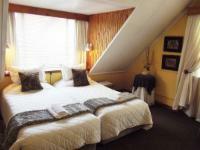 This room consists of two seperate bedrooms, one with twin beds, and one with a double bed. 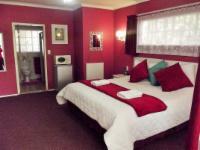 The two rooms share a private bathroom DSTV, microwave, fridge, tea/coffee facilities, towelling gowns in cupboards. Booked as single or double or family. If cancelling 14 days before arrival, forfeit 50% of the booking total. If cancelling 28 days before arrival, forfeit 25% of the booking total. 50% deposit to secure and confirm booking. 100% deposit to secure one night bookings.